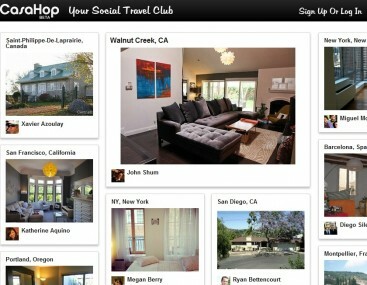 Following in the footsteps of Airbnb and other online home rental services, CasaHop has identified a slightly different approach to the market: It wants to connect people over the Internet who are looking to swap homes with others for free. The social travel site, which launched in beta last month, announced today that it had raised $1.2 million in seed funding. Lerer Ventures led the round with Andre Balazs, First Round Capital, Betaworks with angels including David Tisch, Bob Pittman, Jonah Goodhart, Dave Morgan and Nicholas Negroponte also participating. The founders of the company are Paul Berry, the former CTO of Huffington Post, and Florent Peyre, the former VP of Business Development and Strategy at Gilt City, Gilt Groupe’s local deals business. In an interview at Lerer’s New York offices, CasaHop’s President Peyre discussed how the site is different from Airbnb and uses algorithms to connect people who are likely to be comfortable swapping homes with each other because of shared interests or backgrounds, like fans of rock climbing or French Bulldogs, or alumni of the same university.